Systems Window Awnings called Fossil are beautiful basket shaped awnings used for protection and adding beauty to windows in homes , offices , clubs and hotels . Window decoration is one of the prime target of any Architect or Interior designer and adds that final panache to a home . The importance of Exterior protection of Windows from direct sunlight is actually more paramount than interior decor , simply because Window awnings would be the one single most biggest factor in controlling the heating up of a room thus directly affecting room temperatures , thereby directly affecting the money spent on cooling it down or heating it up. 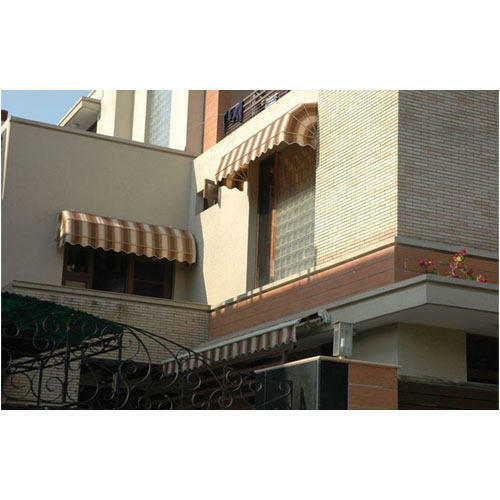 Established in the year 1986, we “Systems India Private Limited”, are the reckoned manufacturer, distributor and supplier of enhanced quality Awning and Bean Bags. Retractable Awning, Residential Awnings and Commercial Awnings are some of major products offered by us. The offered products are designed and manufactured in our fully equipped manufacturing unit by utilizing optimum quality raw material and innovative technology in compliance with the quality standards. They are long-lasting and come in eye-catching designs and colors. These products are more appealing in appearance and accepted by all residential and commercial industrial consumers for beautification purpose of the interior and exterior. Also, the offered products are extremely valued by our esteemed clients for their smooth texture, attractive design, tear resistance, durability, low maintenance and ability to withstand harsh weather conditions. We fabricate and develop in bulk and give well-timed delivery of our products. All our products are reasonably priced and can be offered at any time as per the needs of our patrons.